I couldn’t believe how easy this beef dish is to make! And it’s so tasty and delicious, perfect for a really quick midweek dinner. I’ve seen a few variations of crisped mince served dry but I felt like it really needed a sticky sauce, and so this dish was born. I also upped the veg content by serving on some fresh rice noodles mixed with chopped mange tout, edamame beans, green peppers and bean sprouts and topping with some blanched spring onion. Blanching spring onion might just be my new favourite thing for oriental dishes. It calms down the flavour without any of the over browning or catching you can get when you’re stirfrying at a high heat. Now this was a hodge podge of a meal but aren’t those just the best ones sometimes? I really wanted lasagne and thought I had left over bolognese in freezer. I hadn’t. I’d eaten it. I just didn’t remember. While I was pawing (and shivering) through the freezer I stumbled on a single frozen beef burger, half a packet of quorn and some hidden vegetable sauce. Hidden vegetable sauce is essentially a tin of tomatoes and every roasted vegetable you can think of whizzed up into a purée. Kind of like baby food but also kind of delicious. I had a lightbulb moment to bulk it the quorn with the beef burger and some mushrooms, and make a sauce using the hidden vegetable sauce. I added a bit of Harissa and cinnamon to pep it up and it turned out great, layered with aubergine and bechemel and baked in the oven. That’s a very specific recipe, and if you have all the real ingredients for this I’d recommend making it properly, it’s probably going to be nicer and less of a faff than making your own hidden vegetable sauce to begin with. But if you have any lying around, throw it in!! 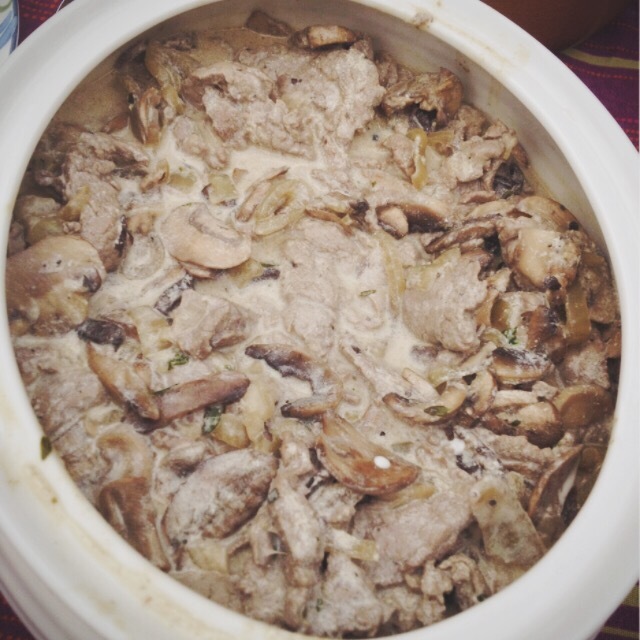 Stroganoff – fun to say, fun to eat. Happy Friday! This is actually my mums recipe, thanks mum! I like it because unlike some other stroganoff recipes it uses no flour so is nice and light.